The driver of a dump truck that proved fatal after overturning on Highway 101 in San Francisco on Friday afternoon has been identified. A dump truck overturned on southbound Highway 101 in San Francisco, fatally pinning the driver underneath the vehicle on Friday afternoon. The San Francisco Medical Examiner's office has identified the driver of the dump truck as 38-year-old Cesar Trujillo Gonzalez from San Pablo. According to CHP, the driver was unconscious when taken out of the vehicle and still had a pulse but died soon after. 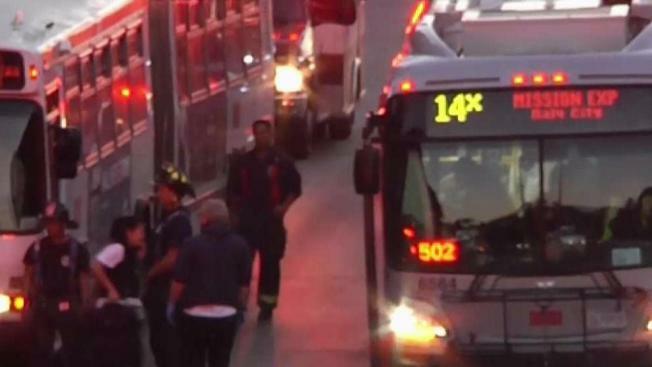 A Muni bus on the scene suffered minor damage, CHP officials said. Five Muni passengers were injured, two of which went to the hospital with non-life threatening injuries. Commuters aboard the Muni were transferred onto another bus and taken away. The truck overturned near the off-ramp exit of Cesar Chavez Street and blocked three right lanes. Officials closed down the affected lanes for approximately two hours, but as of 8:30 p.m. all lanes are now open. As the situation unfolded, the freeway came to a standstill as cars slowly passed by in two lanes, the traffic backed up as far as the Bay Bridge. A commuter stuck in the traffic says a 40-minute trip from the East Bay took him two and a half hours and he almost ran out of gas. "I stayed on the side in case I ran out so I could pull over," said Leo Sigua. Crews were able to get the truck back on its wheels and the freeway back open after four hours. US 101 sb north of Cesar Chavez off collision with injuries. Several lanes closed. Expect delays.